The 2015 Fantasy Football season is edging a little closer with my first two MFL10s of the year completed. You can read my post about my teams from last year and what I plan to do differently this year. I selected riskier guys with upside for the quarterback position. We have no idea what to expect from Jay Cutler, and we still don’t have a true picture of Sam Bradford‘s health. Still, these are guys with a lot of weapons. Teddy Bridgewater started to feel more comfortable with his offense as the season progressed, and the return of Adrian Peterson should really help to take pressure off of the young quarterback. I won’t receive consistent performances from these quarterbacks each week, but when combined, they offer plenty of upside in any given week. Each draft you enter will be different. Sometimes it will be running back heavy and others are receiver heavy. I started with Marshawn Lynch from the fifth spot, and then I selected Alfred Morris and Giovani Bernard as my next two running backs. Morris is obviously not a pass-catching back, so I like having Bernard in the mix to provide value in a PPR format. 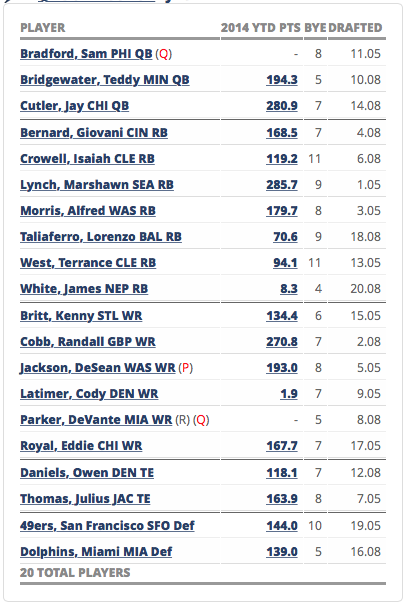 I think Isaiah Crowell was a steal in Round 6, and I protected that pick with Terrance West in Round 13. The Browns will get Duke Johnson involved, but I think Crowell will have the best Fantasy season among the backs in Cleveland. Lorenzo Taliaferro is a handcuff incase anything happens to Justin Forsett, and James White could serve as the pass-catching back for the New England Patriots. I’m finding that Randall Cobb is mostly available at the end of Round 2. That is a great spot to land a top-10 receiver. DeSean Jackson was still a reliable Fantasy option despite the carousel of quarterbacks in 2014. I was all over him in Round 5. After that, I went with receivers who could have strong performances, but their performances would likely vary from week to week. DeVante Parker is a huge threat in the end zone, Cody Latimer is expected to have a bigger role for the Denver Broncos, Kenny Britt could have a nice year with Nick Foles running the show and you can read here why I think you have to own Eddie Royal in MFL10s. I didn’t like any running backs or receivers in Round 7, so I decided to take a chance on Julius Thomas. I also added Owen Daniels because of Gary Kubiak’s familiarity with the big tight end. Looking back, I probably should have added a third tight end. This my turn out to be a weak combo. You can’t predict the fantasy relevancy of a defense, so I just went with two units that I felt were undervalued. I selected Russell Wilson in Round 5. I owned an elite quarterback, so I didn’t have the need to draft two backups. Derek Carr will be a fine filler on Wilson’s Week 9 bye. I went with Adrian Peterson in the first pick of the draft. I don’t mind taking a chance on a running back who wants to break rushing records after a year away from the game. After Andre Ellington, I also took a few more chances on backs with upside or who just need a few opportunities to fall their way. Ryan Mathews will be frustrating to start in standard scoring leagues, but I have the benefit of him only starting for my team when he is relevant. I’ll take a chance on Doug Martin in Round 9, Cameron Artis-Payne is the backup to Jonathan Stewart, Toby Gerhart could rumble his way into the end zone in a few matchups and I selected Taliaferro once again. I think I like the receivers on the first team better, but this is a serviceable unit that could outperform my expectations. I found myself with Cobb once again, but my next receiver I selected was Jarvis Landry in Round 4. I decided to match Landry with Kenny Stills. I think Landry will be a constant presence in the offense, but Stills is the deep threat for the Dolphins. Adding Stills helps to protect my investment in Landry incase Stills just burns past defenders for a ton of yards and a few touchdowns in certain games. The Minnesota Vikings added Mike Wallace during the offseason, but I think Charles Johnson is the receiver to own in Minnesota. 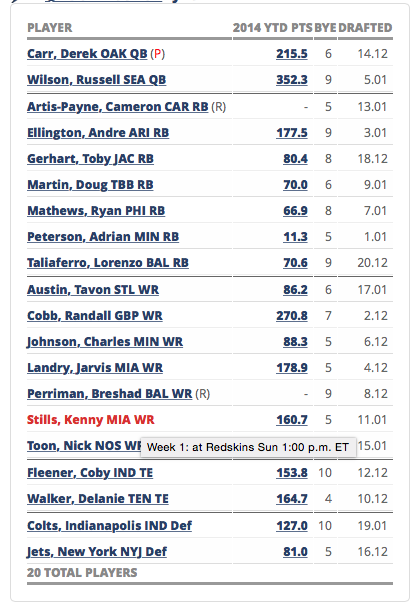 I also went with Breshad Perriman incase the rookie can quickly replace Torrey Smith, Nick Toon as a potential option for more looks in New Orleans and Tavon Austin incase the St. Louis Rams figure out how to use him. I plan on targeting Delanie Walker heavily in most of my drafts. There are only so many explosive tight ends available. What you want in an MFL 10, however, is a player who can provide you consistent results. I don’t mind if he isn’t as exciting as Rob Gronkowski. I believe Marcus Mariota will rely on Walker as his security blanket, and the big tight end is looking at another productive season. The tight ends may lose some opportunities because of all the receiver weapons on the Indianapolis Colts, but I added Coby Fleener incase he does have a few big games. Again, defenses are difficult to predict. I was surprised to see the New York Jets hanging around in Round 16, so I decided that was a good spot to land a potential goldmine of Fantasy points. With an easy schedule I like the Colts. Last season I took too many chances on players who could potentially work out. I think I wanted to show off my choices of potential sleepers, but not enough of them worked out or were involved in the offense. Choose more options that are involved in the offense than sleepers. Theo only players who won’t be immediately involved in an offense on my first team are West and White. The only “sleeper” I have on my second team is Artis-Payne. Don’t get too cute with your picks. Jack Delaney is the owner of Your Fantasy Football Coach. Connect with him on Twitter and Facebook, and make sure to check out his new ebook The Smart Fantasy Football Investor: 2015 Edition to start preparing for your 2015 Fantasy Football draft.